Cisco's charismatic CEO has presided over a remarkable expansion, as the company becomes a more diversified operation. John Chambers is slightly late, but when he appears he is a whirl of smiles, handshakes and bonhomie. He ushers me into his office, but no sooner are we inside than he is off again to fetch some bottled water. On his return, he asks my permission to remove his jacket and when I consent, he insists I do the same. He enquires about my accommodation and thanks me earnestly for making the trip from London to Cisco Systems' headquarters in San Jose, California. There are jokes and anecdotes. I feel as if I've been given a full dosage of the John Chambers experience already and I haven't even got my pen out. Chambers' ability to engage with people has been much remarked on. Carmine Gallo, author of the book Ten Simple Secrets of the World's Great Business Communicators (2005), recently described Chambers' speeches as "astonishing". In a room of 5,000 employees, Gallo wrote, "each and every person feels as if Chambers is speaking directly to him". His style has been compared with that of a Baptist minister, and there is something of the southern evangelist about him, a composite impression derived from his soft West Virginian drawl, his attentive manner and his air of unswerving conviction. He is also media-savvy: when he's having his picture taken later, he strikes a different pose for every shot without being prompted, giving the session a slightly incongruous air, more Vogue than World Business. He fails to deliver only when the photographer, in search of a hard-nosed captain of industry shot, asks him to look angry. "I don't do angry," he says apologetically. Nor does he have any reason to. Last year was an exceptional year for Cisco - sales surged and the stock enjoyed a run of 60%. Cisco started 2006 with a $6.9 billion acquisition of Scientific Atlanta, the number two US seller of cable television boxes after Motorola; other purchases included security software firm Meetinghouse Data Communications for $43.7 million and on-demand television company Arroyo Video Solutions for $92 million. In September Cisco entered the videoconferencing market with the launch of TelePresence, which uses ultra-high definition screens and a state-of-the-art audio system. Shares reached a 52-week high of $27.96 on 18 December and ended 2006 on a slightly lower $27.33 - more than $10 higher than exactly a year before. A few days before our meeting, Cisco stock was downgraded to neutral by two analysts, reflecting a belief that the company's sales growth will slow this year. But Chambers is sanguine. "As a CEO, I don't make decisions on a quarterly basis," he says. "I read the analysts' reports because it's good to listen, but I don't base my decisions on them." The last quarterly statement revealed a 27% jump in revenues and predicted organic growth of 16%-17% for the rest of the fiscal year. Launched in 1984 by husband-and-wife team Len Bosack and Sandy Lerner, who both worked in computer operations at Stanford University, Cisco's core business is in routers, switches and other equipment that carries internet traffic over networks. In 1990 the company went public and Bosack and Lerner walked away with $170 million between them. 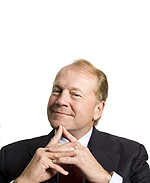 Chambers joined Cisco in 1991, becoming CEO and president in 1995. In the years that followed, Cisco enjoyed phenomenal growth and by 2000 it was the most valuable company in the world, with a market capitalisation of more than $579 billion. The burst of the dotcom bubble the following year hit Cisco hard, but unlike many others the company survived, albeit in a shrunken form. Today its value is about $165 billion - significantly smaller than its all-time high, but still big enough to make it Silicon Valley's largest company. Cisco's expansion into new areas has been fuelled by a desire to return to the giddy rates of growth it enjoyed in the late 1990s. If all goes to plan, in a few years' time Cisco will have transformed itself from a behind-the-scenes, server-room company to one with an established presence in the home and the office. The shift to end-user experience has been made possible, says Chambers, by a dramatic increase in the range of services over the internet. "Over the last few years more intelligence has gone into the network, which has allowed us to be much more than just plumbers - and make no mistake, I'm proud to be a plumber," he says, referring to the profession with which network equipment companies are fond of associating themselves. This new intelligence has fundamentally changed Cisco's business model, he says. "We've always felt this network of networks - the network of the business, the network in your home, the service provider network and the mobile network - would come together. The latest developments are just a logical extension of transitions we identified a decade or more ago." Identifying market transitions is central to Cisco's approach. "If a market isn't in transition, we won't go into it." Ultimately, the goal is to ensure Cisco is the company best placed to take advantage of 'quad play' - the convergence of broadband, TV, landline and mobile services. The company estimates that by 2010 as many as 14 billion devices will be connected to the internet, with more and more services provided online, from phone calls to personalised searches to video games and other forms of entertainment. Cisco is generally acknowledged to be the first company to fully understand the potential of internet protocol (IP)-based services - a prescience that Chambers believes has given the company a head start over other firms. "What has been surprising is that none of our peers moved with us over the last decade, even though we were open about where we were going," he says. "Most have stayed in one customer segment or else they have seen themselves as a router, switch or security player." Now the penny has dropped, many of these companies have begun forays into new markets. But Chambers believes that the time they wasted will make it very difficult for them to catch up. "Innovation is partly about coming up with new ideas yourself, but also about acquiring partnering - and it takes a lot of practice. We hit 70% of our acquisitions; in the industry as a whole about 90% fail. Copying our innovation model and keeping up with the major trends that have taken place will be very challenging for our peers, and they've given us a big lead." But although Cisco is on course to become a highly diversified operation, many of the territories it is seeking to enter are already occupied. Its success to date has been due in no small part to the fact that in the core of the network - the routing and switching element - it enjoys a virtual duopoly with Juniper Networks. The edge of the network, where end-user services are provided, is much more densely populated. Inder Singh, an analyst at Prudential Securities, says the emerging internet-based television market is one area in which Cisco will have to work hard to gain a foothold. "IPTV was initiated by Alcatel," he says. "Cisco bought Scientific Atlanta to get into the action, but Alcatel is winning four out of five deals. Then you've got Siemens and Ericsson, which are also looking into it. It's very crowded in there, and the same can be said of telecoms and all the other IP-based services." One of Cisco's biggest weapons will be its three-year-old Emerging Markets Technology Group, a specialist unit within the company that develops products outside its core networking business. Last year, in addition to TelePresence, the unit launched Digital Media System, a corporate video-on-demand system, and bought SyPixx, a network surveillance service. Over the next five years, the unit aims to launch 15 products, which, it hopes, will not only create new revenue streams, but also help push more traffic through Cisco's networks and thus drive new sales of switching and routing gear. In effect, the company is trying to create growth by investing in itself. But Chambers claims that it is Cisco's method of generating ideas and bringing those ideas to market that truly distinguishes it from its rivals. An in-house website, called iZone, allows employees to contribute and comment on ideas for new products. So far, 135 ideas have emerged. Managers taking part in the company's executive training programme are organised into 'segment councils' and 'tiger teams' to test these ideas by creating business models around them. "We've built a collaborative process that enables us to move with a speed that others can't match," says Chambers. "It took us six years to get this process running smoothly. Now this is one of the main things we teach people in our training sessions - not just how to be a manager beyond their own environment, but how to collaborate to make things work quickly." His emphasis on collaboration is not surprising coming from a CEO, but the impression is that with him it runs a little deeper than a leader's conventional patter about the importance of teamwork. "We are a family," he insists. "I know that's old-fashioned, I know it's corny, but that's what we are. To the best of my ability, I will know about the illness of every employee in the company, and that of their spouse and children." It's tempting to be sceptical - Cisco is, after all, a firm of more than 55,000 people, which must at times yield quite a sicklist - but Chambers is quick to back his arguments with statistics. "Our voluntary attrition rate is 4% in an industry where it typically runs at over 20%," he says. "And last week Fortune magazine ranked us as the 11th best company in America to work for." Google was the only tech company ranked higher and Microsoft was a distant 50th. However, Cisco has been hit recently by the unexplained resignation of Mike Volpi, head of the data routing and telecoms business, and considered a potential successor to Chambers. Chambers' passion for the company, not only as a business but also as an employer, is so complete that it becomes virtually impossible to tell where Cisco ends and he begins. Like many expert communicators, he is difficult to read. He is energetic, enthusiastic and youthful, but his preacher-like zeal does not leave much room for idiosyncrasy or self-revelation. Prompted to reveal his passions, he offers only a fleeting glimpse of his life outside the company. "I love time with employees, I love time with customers and I love to drive 100 miles an hour on two wheels off the road," he says. When asked about his weaknesses as a leader, he replies that he has many, but then struggles to identify any. The best he can comes up with is that he's an "A, B, C, Z person - you give me a certain amount of data and I'll jump straight to the end". But being a big picture man as opposed to fine detail can hardly be considered a weakness in a CEO, especially if, as he contests, he has a "fantastic leadership team" beneath him that deals with the day-to-day elements of the business. Chambers has previously admitted that his dyslexia caused difficulties during his childhood and has helped create his work ethic and polished communication skills. It may also explain his passion for education: Cisco's Networking Academy programme, through which students are taught internet technology, has establishments in more than 150 countries. The condition also forces him to prepare for speeches extremely thoroughly, including memorising sections of presentations. During our interview, he answers every question fully and at length, but hardly pauses for thought. He doesn't even hesitate when probed about the thorny issue of Cisco's lawsuit against Apple over the latter's use of the name iPhone, which Cisco trademarked in early 2000. Cisco's Linksys arm launched its phone, which connects to the internet, last December. Apple launched its handheld mobile phone under the same name in early January without Cisco's permission. Apple says the lawsuit is "silly" and claims that Cisco's trademark registration is "tenuous at best". Chambers' response, characteristically, is more honeyed. "Apple is a great company and their success has been amazing. I think Steve Jobs is an amazing leader," he says. He wants Apple to recognise Cisco's ownership of the name iPhone and agree to inter-operability between the two company's products. "This is just a minor bump along the road - one that I wish we'd avoided, but a minor bump all the same." Chambers has been chief executive of Cisco for 12 years - an impressive feat in the US' Darwinian corporate landscape, especially when you factor in the dotcom crash. He has won many prizes, including Best Boss in America, Best Investor Relations by a CEO and the Most Influential Person in Communications. He is on the board of Wal-Mart and has served two US presidents, most recently as vice-chairman of George Bush's National Infrastructure Advisory Council and before that on Bill Clinton's Trade Policy Committee. When does he plan to quit as CEO to concentrate on other pursuits? "I think one of my jobs is to ensure a smooth transition when the time is right," he says. "But it's not going to occur in the short term unless I get hit by a truck or one of our four constituencies (customers, employees, shareholders and partners) loses faith in me. I've made a commitment to stay for at least another three to five years. We have a great leadership team, we work as a team and we have fun as a team, and if I've done my job right we'll make the transition to the next stage of leadership without any bumps. "That's how we've done it before and that's how we'll do this. I realise that's a different approach to just about any other hi-tech company out there." 1982: Marketing manager, Wang Laboratories.